There was a great energy today as we worked at NRO. It feels like we are making real progress and connections. Last week I spotted a Land Tax reference in the Coleman Collections directory so I requested it ready for today with no idea if it would be useful or not. It’s an early reference, but last week we had spoken about how we hadn’t seen any records of how the tax collecting was recorded. 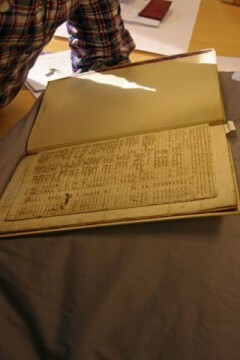 This book gave us a starting point, hand written with amounts for property and amounts for stocks. Wendy mentioned a reference she had written down from the on-line catalogue. 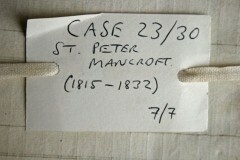 When Susan joined us we discussed this early document and Wendy’s note and off she went and came back with two bundles of documents, Land Tax records for the parishes of St Andrews and St Peter Mancroft. 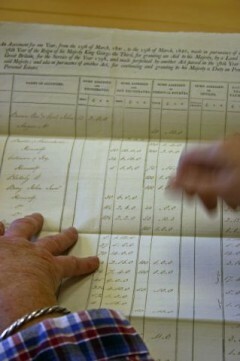 Looking at 1821 records, the information is now entered into specially printed forms. There is, after trying to decipher difficult handwriting, a real joy in a form filled in with readable or mostly readable information we can make sense of. The number of entries is much larger which logically follows the rise in population in Norwich over the 100 or so years between the two sets of information. One of our characters Yallop, a commissioner is mentioned as paying some 50 pounds in the St Peter Mancroft Parish (the church opposite the forum in Norwich), not an insignificant amount of money at the time. So being a commissioner in no way was an exemption of the tax. It also didn’t mean that he personally went around collecting money, rather he appointed staff to be both assessors and collectors. 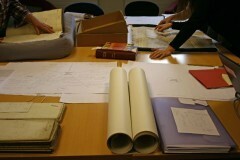 The other two detectives spent time looking at the United Friars materials. A history of the group was written by M Knights when the documents where held in the Coleman collection. On reading the account one of the History Detectives Elaine was questioning Knight’s interpretation, do we trust his referencing or paraphrasing, does he stray into embellishing? Something we might call in the trade artistic license perhaps. In the afternoon I asked each member of the group to talk about a document of their choice. This audio recording trial run was really useful and gave me some material to work with over the next week. 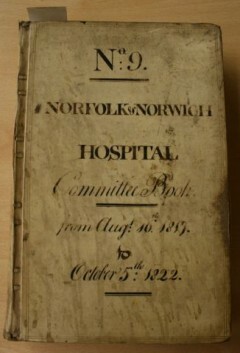 From the notes prepared by the Parliamentary Archives, Martineau was an ‘eminent surgeon at the Norfolk and Norwich Hospital, where he volunteered his services’. He was well thought of in Norwich and beyond, as he communicated with the Royal Society on medical matters. The notes describe his as possibly socially snobbish if intellectually radical which indicated he was a man sure of himself. 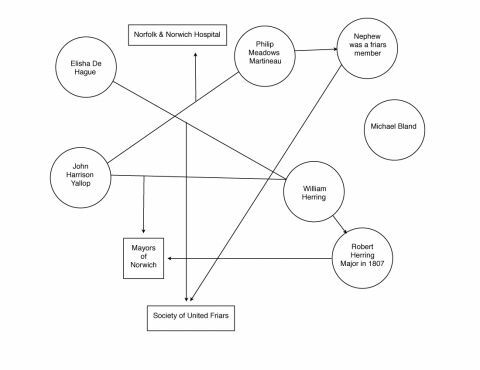 In Norwich we possibly know the name best in connection with Martineau Lane where County Hall is found. Indeed this was on his land that County Hall was built. There is a discrepancy between two sets of notes I have, in terms of an association with the United Friars, was it Philip or his nephew (also a surgeon) who participated in Friars meetings? In any case he was generous in his commitment to the care of the poor. 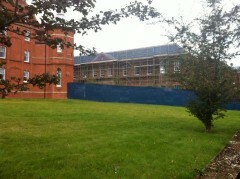 The old Norfolk and Norwich hospital located off St.Stephens Road is being redeveloped into housing and they are finally after a considerable number of years, starting on what I think is the original Georgian part of the hospital complex. Martineau’s house was demolished to make way for County Hall in the 1960’s, notes indicate there is a folly within the grounds which I shall, given time, seek out tomorrow. Yallop is a very interesting character to explore in this project, There are some almost comic moments within his life which seperate him from other commissioners who were perhaps more philanthropically minded. He became the agent for Government lottery tickets and then after finding an unsold ticket in his safe (all unsold tickets were to be returned to London) he decided to purchase it. 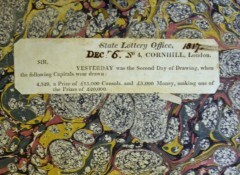 The ticket was found to be a winning ticket, but exactly how much was won is unknown. Although he doesn’t appear to been concerned with social matters such as soup kitchens or poor relief he has been noted in record books related to the Norfolk and Norwich hospital, with another commissioner Philip Meadows Martineau who I will write about tomorrow. Yallop was well known and powerful within Norwich, elected as Alderman, Sheriff and Mayor (twice) all rounded off with a knighthood in 1831. My personal associations with the name Yallop are with the old Yallop shoe shop that used to be towards the top of St Augustines in Norwich, just up the road from my studio. Spent an enjoyable morning constructing digital trial compositions. The proposal for the final artwork will need to be approved by the project board but experimenting with formats and software ensures as far as possible I have all the material I need when it comes to the final edit. I’m using simple software programmes to put images together with audio which has resulted in a very productive mornings work. To aid the process of the layout of the piece I have asked the group to add information to a long piece of paper, the diagram is taking shape and I have taken the opportunity to map out some of the facts in separate documents. Something happens to text when it is moved from the paragraph to the diagram, it definitely helps the visual process. My diagram text is typed, most of the documents we are looking at are hand written and at times hard to decipher (there are some printed exceptions). Last night on Start the Week on Radio 4, there was a conversation about ‘the dying art of handwriting’ – you can listen again via BBC website. 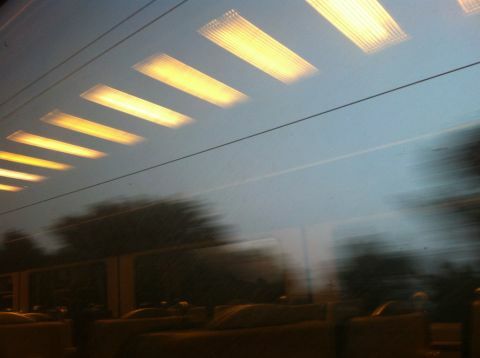 It includes discussions about tweets, blogs and podcasts so the digital finds its way into the conversation also. 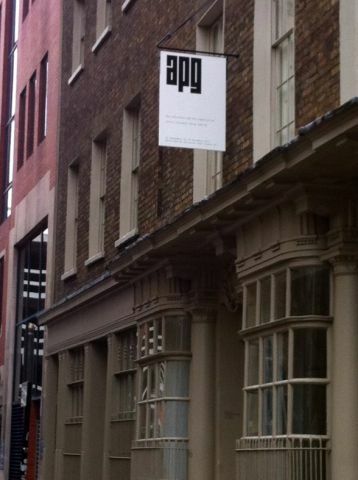 The Individual and the Organisation: Artist Placement Group (APG) 1966 – 1979 at Raven Row, is a must see exhibition for anyone who is interested in context, dialogue and placements. APG sought to place artists within industrial situations, government departments and offices. By negotiating an open brief, removing the need for tangible outcomes, the artists were offered freedom to explore, discuss, debate and negotiate with those from a non arts background. My long standing interest in APG has taken me to the Tate Archive and to plan an in conversation event with Barbara Steveni at firstsite in 2011. Barbara undertook much of the correspondence relating to funding this new art practice model and negotiating the placements. With my interest in industrial contexts and processes out conversation focused on how success is measured within this way of working. “Number 3. Creative participation. The visitor provides content for a component of the work within a structure established by the artist. I would say this project sits within this 3rd definition (the others are 1. Nominal Participation, 2. Directed participation and 4. Collaborative Participation). The added dimension is that this project is a commission so the terms have been set by the commissioner such as the historical focus and that the outcome should be digital. The History Detectives and I are engaging in a very interesting dialogue and we explore the materials together with help from archive staff. We will work together to select content to include in the final artwork. As a process led artist, and one who works repeatedly on residencies I need to immerse myself as fully as possible within the site or subject. I enjoy working with ‘non artists’, people from different professional backgrounds and with different interests. This allows the process to be based on discovery, exploring terminology and documenting different visuals and processes. What I am having to do in this project is work without historical photographs which presents specific challenges, but it’s good to have challenges to my existing process. There is an outcome required for this commission, I’m starting to think about what this might look and sound like and will be asking the group to talk when we next meet on Thursday about a favourite document which relates to our focus.